Actively managed, the Fund maintains a concentrated portfolio of midstream energy companies and seeks to deliver a significant and predictable income stream. The Hennessy BP Midstream Fund invests primarily in core midstream companies that transport, store, and process oil and natural gas. The Portfolio Managers seek companies with lower commodity price exposure, a "demand-pull" bias, and strong balance sheet metrics, with sufficient cash flows to support an attractive yield. The Fund is sub-advised by Dallas-based BP Capital Fund Advisors, LLC. Working alongside legendary energy investor and BP Capital founder, Boone Pickens, the Portfolio Managers have developed deep relationships across the energy industry and maintain a sole focus on energy investing. Portfolio Managers Toby Loftin and Ben Cook discuss growth prospects and the outlook for distribution and dividend growth for midstream companies. They also outline how the Fund’s holdings are poised to benefit from rising global energy demand. Hennessy BP Midstream Fund Portfolio Manager, Ben Cook, shares his insights on key trends driving performance for midstream energy companies and discusses the outlook for the sector and investment opportunities for 2019. 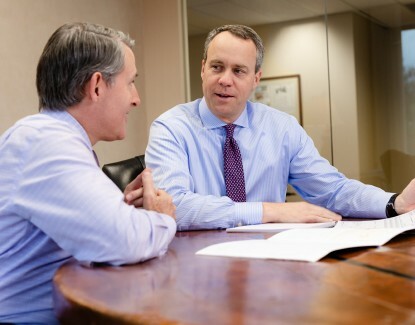 Portfolio Managers Toby Loftin and Ben Cook discuss the business operations and primary growth drivers of midstream energy companies, and the Fund’s investment and distribution strategies. The Alerian MLP Index is a market capitalization-weighted index consisting of prominent energy Master Limited Partnerships (MLPs). The S&P 500® Index is an unmanaged index commonly used to measure the performance of U.S. stocks. One cannot invest directly in an index. The performance shown for periods on or prior to 10/26/18 is that of the predecessor BP Capital TwinLine MLP Fund. Distribution Rate reflects the investment income per share during the last 12 months divided by the share price at the end of the period, expressed as an annual percentage rate. It is calculated by annualizing the Fund’s most recent distribution. The annualized dividend yield may not reflect the actual yield an investor would receive. 30-Day SEC Yield is a standardized yield computed by dividing the net investment income per share earned during the past 30-day period by the share price at the end of the period, expressed as an annual percentage rate. The 30-Day SEC Yield should be regarded as an estimate of the Fund’s rate of recent investment income, and it may not equal the Fund’s actual distribution rate. Past yields are no guarantee of future yields. 30 day SEC Yield subsidized 0.04%; unsubsidized 0.00% as of 3/31/19. Subsidized yields reflect fee waivers in effect. A significant portion of the BP Midstream Fund's distributions to shareholders will be characterized as a "return of capital" because of its MLP investments. Please refer to the 19a-1 Notice sent to shareholders or Tax Forms 8937 for additional information regarding the composition of distributions. Final determination of a distribution’s tax character will be made on Form 1099 DIV sent to shareholders each year. The Fund's investment manager has contractually agreed to limit expenses until 10/25/20. References to other funds should not be interpreted as an offer of these securities. DOE refers to the Department of Energy. EIA refers to the U.S.Energy Information Administration. FERC refers to the Federal Energy Regulatory Commission. The Hennessy BP Midstream Fund pays capital gains (if any) once annually, usually in December. Ordinary income distributions are paid quarterly, at the beginning of March, June, September, and December.